One of the most common benefits parents cite as a reason for enrolling their young children in preschool and primary school is the social growth they expect their children to enjoy. After all, our children can blossom in life as they develop effective social skills for interacting with adults, older children, younger children, and their peers. And primary school offers daily opportunities for your child to practice how to cooperate with others and learn how to navigate their social life with skillful ease. Fortunately, the Montessori method embraces this essential aspect of your young child’s development. In fact, even though Maria Montessori believed in encouraging children to develop their strengths and passions through individual, self-directed work, she also understood the value of encouraging them to develop socially. A Montessori classroom isn’t just about reading, writing, and arithmetic. Social development is an important element as well. 1. Children are encouraged to learn according to their natural stages of development. In a traditional classroom, most of the activities are teacher-led, which means that children may be required to engage in more social interaction or more individual work than they are naturally inclined to do. But in a Montessori classroom, learning is very much determined by your child’s natural stage of development. What does this mean for your child? Put simply, it’s not unusual for children under the age of 6 to prefer individual work, because at this stage of development, they focus and work best while on their own. But as children reach primary school age, they enter a new stage of development, becoming more ready to interact socially and work collaboratively in the classroom. Montessori schools embrace this natural development and encourage it. 2. Children learn to know and value their individuality. You may not have thought about this before, but our success in life has its foundation in how well we know ourselves and how well we are equipped to pursue what makes us unique. The emphasis that a Montessori education places on allowing your son or daughter opportunities to explore and learn at their own pace is a vital way to ground your child with a strong sense of self. As your child learns and grows as an individual, he or she will also develop confidence and courage to engage with others. And because a Montessori classroom embraces individuality, your child is free to be fully himself or herself, helping them to be at ease as they learn and grow both personally and socially. 3. Children engage in collaborative work. There’s a common misperception about the Montessori method—the idea that by focusing on a child’s individual development and work, the classroom won’t encourage the development of social skills. But nothing could be more mistaken. The truth is, Montessori schools strongly encourage and foster student interaction with their peers. For kindergarten and young primary school aged children, this can include a blend of partner work, whole class activities, and more. As children grow older, they are given opportunities to act as mentors to younger children, so that their social skills can grow even more—something that is definitely not common in traditional schools where children are separated by age. 4. Children actively practice grace and courtesy. One of the key tenets of the Montessori approach is to instruct children in social graces. This means helping children to understand and practice politeness, respect, kindness, empathy, and courtesy. 5. Children develop emotional intelligence. A great benefit of enrolling your child in a kindergarten or primary school that practices the Montessori method is that it’s a powerful way to help your child develop emotional intelligence. This skill set refers to a person’s capacity to know control, and express his or her emotions effectively, as well as the ability to handle interpersonal relationships with wisdom and empathy. And children who have it do well in life. The Montessori classroom encourages such skill development by actively helping children recognize and name their emotions, express them politely and skillfully, and understand that even our strongest emotions will pass with time. By learning to successfully manage their own emotions, your son or daughter will also develop the ability to interact with others, even in the face of strong emotions. 6. Children are empowered to embrace differences. The Montessori philosophy is founded on the idea that each child is an individual. And this concept naturally extends to each adult, each community, and each culture as well. Montessori instructors encourage their students to learn about the world outside the classroom, and invite students to learn about the world they live in. As a result, your child can begin to recognize and appreciate that each person is unique. Differences are accepted and appreciated, rather than criticized, feared, or discouraged. As your child internalizes this philosophy, he or she will be better equipped to engage socially with anyone, anywhere, regardless of our individual differences. As you consider ways to ensure your child enjoys the best education they can get in Rockville, MD, remember that the authentic Montessori education offered by Primary Montessori Day School is a wonderful, proven method for developing strong social skills in your child. Learn More! 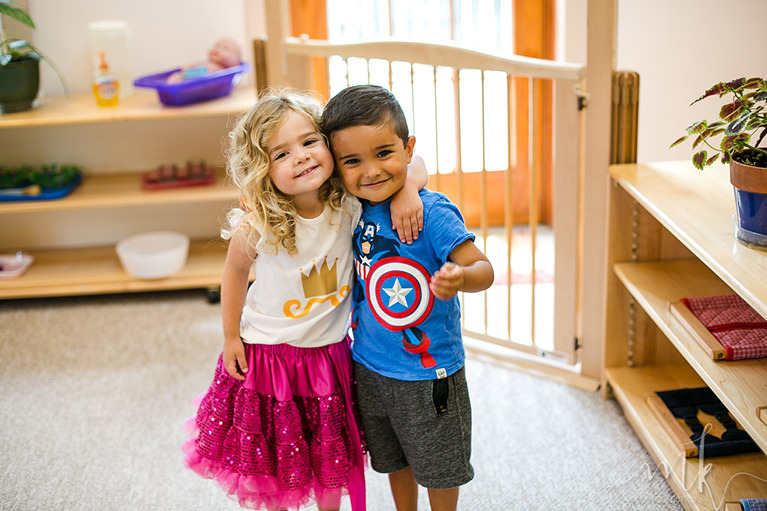 Contact us today by calling (301) 309-9532 or using our online form to schedule a tour and discover how a Montessori education can bring out the best in your child, both now and for years to come.